When TLC's Extreme Couponing show first previewed in December 2010 many viewers were in awe as they watched $2,000 worth in groceries cost just $100 after applying coupons. Many viewers who never used coupons thought, I can do that! Unfortunately many of those same viewers missed what happened after the program aired. Savvy couponers, also watching the program, quickly jumped on their blogs and pointed out all the coupon misuse going on, including redeeming coupons for incorrect items, redeeming counterfeit coupons and making exceptions to store couponing policies that the normal shopper would never receive. In other words, the show was a fake. Does that mean that diehard couponers cannot save thousands on their food bill? Absolutely not. But that kind of extreme couponing takes a lot time, work and dedication and even then most "extreme" couponers will only save an average of 60-70% each shopping trip. I average an email a week from coupon clippers that are disappointed with their savings from using coupons because they are comparing it to the "extreme" couponers. They become discouraged because their expectations are too high. If you are a casual couponer, be satisfied with any savings that you get from using coupons wisely. If stick to it, your skills will improve as will your overall savings. There are thousands of coupons for thousands of products and chances are you will not like all of them. Just because you have a coupon for an item does not mean that you must buy it. If there is a shampoo that you have used in the past that you did not like, it won't improve just because you got it cheaper by using a coupon. A good rule of thumb to follow when using coupons is -- buy products you like, try to use the coupons when those items are on sale, and if the generic is cheaper, buy generic. 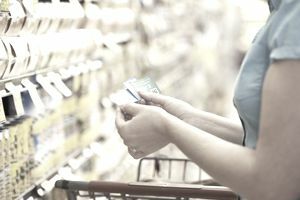 Smart shoppers stock up on items that they know that they use regularly, but clearing the store shelves of items just because you have coupons for all of them can be wasteful and also results in stores tightening coupon acceptance policies. In fact, since "Extreme Couponing" aired, many stores have already set new policies about how many coupons on one specific item can be redeemed per day. If you know that you plan on buying a lot of a particular item, speak with the store management and ask them to order it for you. Also, remember that you will need room at home to store what you buy and you will want to use it before it expires. Buying an excessive amount of all the super good deals at the grocery store can end up costing more than what you had budgeted to spend. In fact, a study co-sponsored by Washington University in St. Louis found that coupon clippers often spend more money than the average shopper. Some couponers will tell you this happens because they are building up a stockpile. A good rule of thumb to avoid over-spending and still build a stockpile is to do it over time and to stick to the allotted amount of money you budgeted for stockpiling. While having a great looking stockpile may be impressive to your neighbors and friends, it is completely useless if you never use the items that you are stockpiling. I've known couponers that refuse to use, for example, a can of beans from their stockpile because they only have six cans and they want 12 cans. Huh? A good rule to follow is to shop first in your stockpile and second in the stores, that's if your goal is to save money on groceries. Couponers generally stick to the rule that using coupons on the smallest size of an item that the coupon allows will save you more than using the coupon on the largest size. While this is true most of the time, there are times when the opposite is true. That is why it is helpful to shop with a calculator so that you can figure out what the best price will be after applying your coupon. Folgers Medium Classic Roast Ground, 11.3 oz, $4.58 or $0.41 per oz. Folgers Medium Classic Roast Ground, 11.3 oz, $2.58 or $0.23 per oz. Although you will almost always save more money by using coupons on the smallest size, it pays to take the time to do the math. Most coupons have usage policies printed on the coupon. It can be minimum sizes that need to be purchased to use the coupon, specific colors, specific flavors, quantity limits and even regional coupons with zip code limits. Always take the time to read the coupon and follow the rules. Understandably couponers are not perfect and a coupon can be turned over, and then mistakenly redeemed by a cashier, to do it on purpose is not ethical or honest. This is probably the one are that I get very lazy about because of the extra time that it takes, but my laziness has cost me a lot of money in the long run. Don't be like me. Take the time to ask for a rain check when an advertised sale item is sold out at your grocery stores. Every couponer has experienced going through checkout and realizing either they misread a coupon or the sale price on an item, or the cashier/manager just refuses to budge on a price or accept a coupon, even though they are wrong. Either way, if an item is going to cost you more than what you thought you would spend on it, pull it out of the bag and nicely ask that the cashier remove it from your total. Failing to do this can really get expensive. You end up with items that cost you more than what you would ever pay under normal circumstances. By doing this, it also helps you discipline yourself to pay attention to the scanned prices as the cashier scans your items. Using coupons can be exasperating at times. You have to deal with eye-rolling cashiers, customers muttering profanity at you, managers that are barely trained and employees that don't even know their store's policies. But you also deal with moms working a part-time job, students trying to pay their way through college, parents who work six days a week, 10 hours a day, then go home and take care of kids. Just like everywhere, there are all types of people working in stores. When things fail to go your way with your coupons, just keep things nice and leave with as much savings as you can. It just is not worth getting into heated verbal disagreements. Are Your Grocery Shopping Habits Costing You Money?